Time to confess... What was the last pricey purchase you made? Love the jacket! Great purchase! Your hat is honestly to DIE for, i'm obsessed! i love this jacket! thanks for the link! Amazing hat and such a gorgeous scarf!! Fab!!! the hat is gorgeous! The jacket is really stunning. Great style Anna. Love that look... last pricey purchase I made was was for thigh high winter boots! Nice outfit! It's so classy! Great look! The jacket is absolutely beautiful, amazing purchase. You look so stunning, Anna. The last big purchase I made was an Alice and Olivia sequin blazer. The original price was $300, but I got it for $199. Not a bank breaker, but still a lot. The hat is everything. Dying. Great jacket and love the hat! A wonderful look. Smart shopping! Love this look on you, Anna. The hat and jeans give it a 70's feel. Thanks for the sweet comment you left on my latest post. Love it when you wear jeans...this is a great look and I'm dying for that hat! yesterday i purchased three prs of louboutins & a valentino jacket, but all my clothes are spendy (relax, i have the income to back it up). i dont know if id call that jacket "tuxedo" & you should really have it tailored to fit you better. expensive clothing looks cheap if it fits you sloppy. the hat is cute. wish i had a "hat head". I never understand comments like this. Why someone would go out of their way to say anything less than friendly is sad. I love the coat, Anna. I was just thinking the same thing, Tanya. The funny thing is that she probably doesn't even think she's being rude. So weird. Great tip and outfit, Ana. Love this. wow, that jacket is amazing! And love the hat!! I haven't splurged on 1 item lately, sounds like I need to do some shopping! I absolutely adore the hat and the scarf!! They accent the Zoe jacket perfectly!! Very cute, Anna. Great tip too. LOVE your pattern mixing, and that hat looks so cute on you! I love this look! I really like those jeans too! Hi! is the first time that I visit your blog and just love it! you are really stylish and this outfit is so beautiful !!! If you want come into my blog, and tell me what you think about him, and if it likes you, what about to follow each other? I would be really happy! Love this look great hat. I love how you pair inexpensive and expensive investment pieces together so well! Definitely an inspiration and something I am trying to adapt in my own wardrobe! You look amazing! Love the hat and the scarf!! Love the hat and nail art! The jacket is beautiful- definitely worth it! You look great. 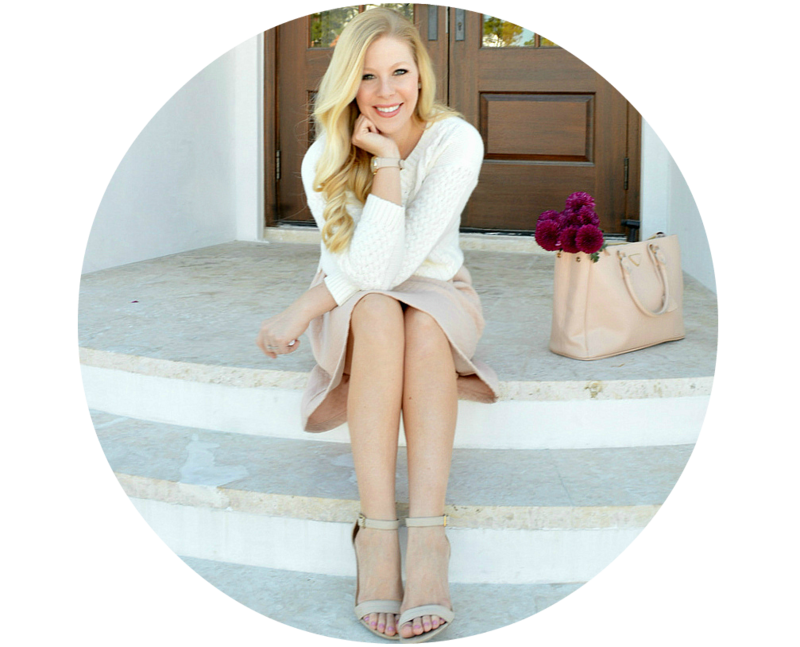 I just started following your blog and was hoping you could check out mine (I blog with my sister) at http://scottsisterstyle.blogspot.com. Hope you like the blog and will follow us back! Thank you! Love the jeans and shoes, they pair beautifully. I wish I could find a pair of jeans that weren't skinnies that would fit me remotely well, but I'm short, and tailors won't be in my budget until I'm older. Given my college student status, I don't really tend to allow myself to buy much- anything over about $30 is a serious splurge. The last "pricey" piece I bought was a very fancy dress that I'm going to wear to pretty much ALL the super-fancy events coming up (there are a surprising number of them, actually). It was on sale, but I still felt completely ridiculous buying it, until I realized that no one at my university would feel personally offended about me wearing the same outfit twice, unlike the way they feel about inaccurate math, so I managed to justify it to the point of not feeling at all bad, which was nice. This is such a great point about the high low. I think the last pricy piece I bought was a jacket too. A leather jacket from Zara for winter. :) You look gorgeous and I love how you put this together. That jacket is amazing and so is your hat! Looking so fabulous. Adorable. Love how you styled that jacket! Love everything about this outfit Anna! Looking for a good striped shirt. There are a million out there, don't know why I'm being so picky! 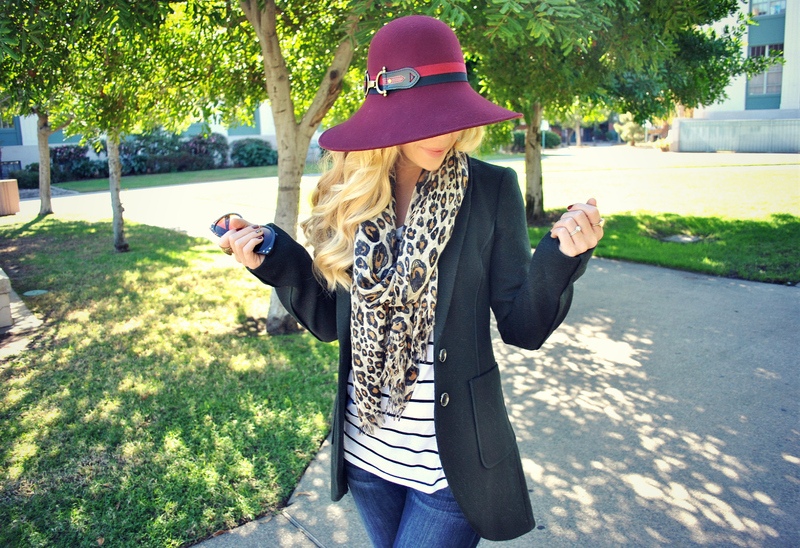 Great hat and love the Rachel Zoe jacket. I love that you pair expensive with inexpensive while still crating a cohesive look! Beautiful jacket. This is such a smart idea and totally realistic for normal girls out there. Great post, hun. This outfit is gorg. I love this outfit. Jeans with a dressier top has been my go to recently (too cold for skirts and dresses). You look amazing! And that is a great tip! If you can pair it with a variety of pieces and keep it for a very long time! Great jacket and hat! I love to mix and match high-street and designer too. I tend to spend more on accessories like handbags and shoes and sometimes jewellery. I'm the same way! I love when I find something expensive that can easily go with something less expensive. 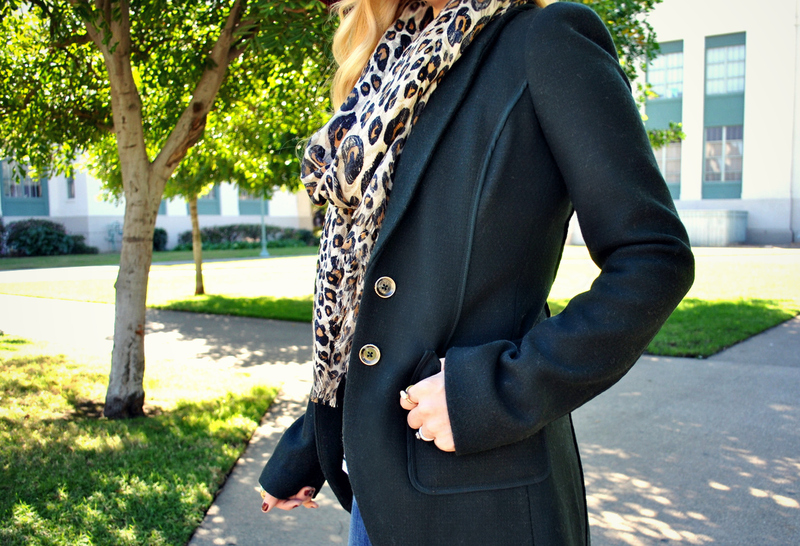 That Rachel Zoe jacket can go with so many outfits! I love your outfit and the jacket is perfect. I totally agree with mixing expensive with inexpensive. I recently bought a pair of J Brand Jeans that I will have like forever. They fit amazing. beautiful piece! i love everything rachel zoe! you'll have that forever. so i recently splurged on over-the-knee stuart weitzman 50/50 boots. while they were super expensive, my price per wear is under $30 at this point and just getting smaller - i wear them all the time! I think it was worth the investment!! Fabulous find! And I love the hat as well. Just visiting your blog for the first time! Nice to meet you! Love the jacket. Looks fab on you as always! I recently splurged on a new Hobo bag and am so glad I did! You look so adorable, totally casual chic. Love you in that hat! I love this hat - one of my favorite colours at the moment! Love that jacket! Such a great purchase! Love finding pieces that are pricey but can go with anything! That way you do get more bang for your buck! I love love love the hat! Super cute. i try to keep a good balance too. i sorta splurged by buying a j crew coat this winter. the past few years, i've bought cheaper coats, but since i live somewhere cold, a nice coat was so worth it! 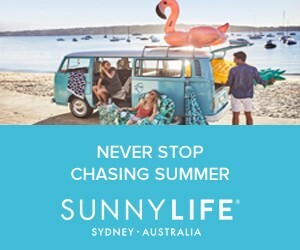 My most recent splurge was on the Ray-Ban clubmaster sunglasses - I usually pay no more than $10-20 dollars on sunglasses because I am constantly losing or breaking them. However, I took the plunge because I've been lusting over them for months. You look great! Especially love the hat! Beautiful photos. I love the jacket and how your nails match your hat! Gorgeous hat by the way. I don't splurge on items that often, but I did before Christmas. I bought a Kate Spade bag. I love it, and even then I managed to get the bag 55% off!!! That coat is fabulous and you'll have it forever! girl you look stunning!!! please stop by my blog and check out my looks too.. :) thanks :) love your blog!! That outfit looks great! 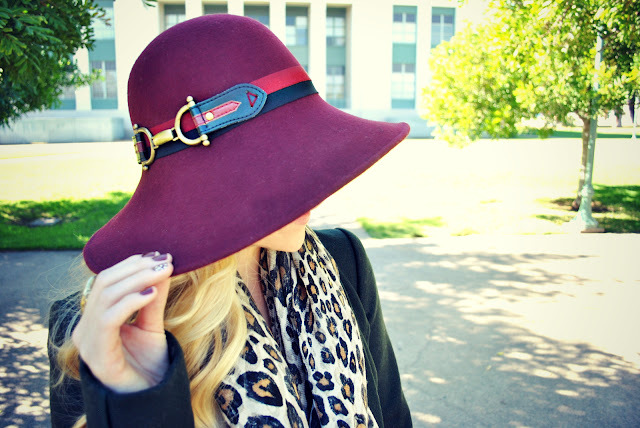 Love the combination of stripes, leopard and a plum hat! Gorgeous! That hat though! <3 I love how professional this looks but its also fun. I totally love this look. That jacket is stunning and definitely versatile. This whole outfit is beyond amazing! I love this outfit! The scarf just ties everything together. I have to admit that I splurged on designer sunglasses a few years ago (Maui Jims), but I absolutely love them and am so grateful I spent the money. They look good with every outfit because they're so classic -- plus they're polarized! That's a great tip you are giving when shopping for pricey things. The jacket is really pretty and btw, I love how you paired stripes with animal print ! Will try that one ! Love this look! The nails are perfection!